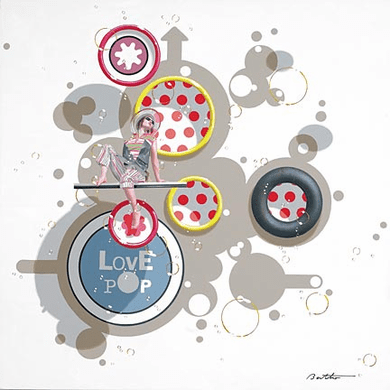 Philippe Bertho Artist Hand Signed and Numbered Limited Edition Hand-Pulled Serigraph On Canvas: "Love Pop 3"
Sometimes it takes awhile for an artist to find himself. Such is the case with French-born, Philippe Bertho. He has been a lumberjack, a salesman, a warehouseman and more. But when a true artist finds his voice, the results can be nothing short of masterful. And masterful is the best word to describe this extraordinary artwork. Philippe Bertho is classically trained having enrolled in art school in Reims, France in the early 1990s. There, he spent considerable time studying decorative trompe l'oeil painting. Tromp l'oeil ("to fool the eye") is a technique used by artists to create the illusion of a 3rd dimension on a flat surface. As a technique with which Bertho has grown adept, it is obvious from his artwork that he fools more than the eye - he draws one in by the heart and also quite frequently by the funny bone. First in his class, Bertho graduated from art school with honors and then went on to paint frescoes and poster art while also working as an art teacher. Along the way, he refined his painting technique by copying the great masters. Originally, he worked in oil, but finally settled on the more contemporary medium of acrylic paints. Despite his ability to perfectly render reproductions of master works, Bertho was drawn to the world of fantasy and illusion. As his style developed, he drew inspiration from renowned contemporary trompe-l'oeil artist, Jacques Poirier. In his early work, Bertho exhibited ingenuity by including unusual materials in his paintings. Employing objects that other's found useless - corrugated iron, rusted metal boxes, old light bulbs - he was fascinated with his ability to bring his art alive by creating dimension - either by the addition of these items directly onto his canvas or later through the technique of trompe l'oeil. In 1995, Bertho's artwork garnered accolades at the Regards sur les Arts salon show - a new talent showcase in Lamballe, France. He was well on his way to developing his unique approach to trompe l'oeil painting. The style that he developed cast a new look on everyday objects, transporting the viewer into an imaginative and rich world. It has been said that Bertho's paintings create a world where the whimsical meets the witty, a juncture between the fanciful and the eccentric. And into his paintings, Bertho inserts mischievous characters - climbing, searching, running, thinking - each painting evolving into a "hyper-realist" world, little scenarios of his own ingenious invention. Most recently, his attention has turned towards Pop Art. Using a combination of narrative figuration and Pop inspiration, the result has become the basis for his simple, thought-provoking artworks. It is as if these works define the phrase, "the more you look, the more there is to see." In an artistic sense, his technique is precise, crisp and masterful. In an imaginative sense, the surreal nature of his artwork begs the question, "What was the artist thinking when he painted this?" Perhaps the question should be, more accurately, "What are we thinking when we view his artwork?" The tiny characters that inhabit the bizarre world created by Bertho's paintings seem to nonchalantly accept the ridiculous situations they find themselves in, as if it is perfectly normal to read a newspaper or do a tap dance while perched inside of a bubble. Others seem determined to explore the illusory three-dimensional space of the canvas - climbing in and out of spheres as children do on a playground. It seems absurd that they are not dismayed at their surroundings - or is it absurd that we are? There are no correct answers, only more questions posed by viewing each of Bertho's imaginative paintings. There are as many different responses as there are people viewing his artwork. This is precisely what makes his work attractive and confounding, simplistic and complex, all at once. Philippe Bertho is an extraordinary new and young talent and he is beginning to garner strong attention within and from outside of the art world. To our delight and enjoyment, he has finally found his voice and is beginning to fulfill his artistic calling. Determined to stay true to his imagination, sense of humor, rich creativity and distinct originality, Bertho's leitmotiv seems to be - to keep his unique personality intact, at all costs, and to share with each of us a glimmer of that personality in these remarkably unique paintings. Bertho's artwork is widely collected by institutions and individual collectors worldwide, and has been shown in galleries in Europe, the United States and the Caribbean. He has participated in salon shows and exhibitions throughout France.